It’s a watch – it’s a timer – it’s an alarm – it’s the latest in the interesting new GPS rangefinder watch category and perhaps best of all it’s from the makers of the long time leading laser rangefinder on the Tour, Bushnell. The NEO+ Golf GPS Watch is easy to operate and lightweight providing front, back and center yardage for play at 25,000 preloaded courses plus it lasts for up to 14 hours on a charge. There’s good news also as far as the annual fee is concerned, there is none so all you need to do is strap it on and tee it up. 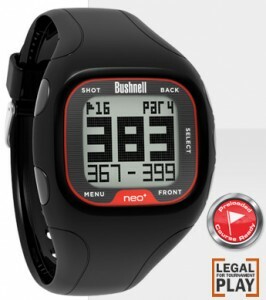 Available this month the Neo+ Golf GPS Watch carries an SRP of $199.95.